One solution is to equip each room with a bluetooth device. Once your phone is within range of a bluetooth device, your phone will know which room it is, based on the bluetooth device. However, maintaining an array of Bluetooth devices is significant overhead — from replacing batteries to replacing dysfunctional devices. Additionally, proximity to the Bluetooth device is not always the answer: if you’re in the living room, by the wall shared with the kitchen, your kitchen appliances should not start churning out food. Another, albeit impractical, solution is to use GPS. However, keep in mind hat GPS works poorly indoors in which the multitude of walls, other signals, and other obstacles wreak havoc on GPS’s precision. Our approach instead is to leverage all in-range WiFi networks — even the ones your phone is not connected to. Here is how: consider the strength of WiFi A in the kitchen; say it is 5. Since there is a wall between the kitchen and the bedroom, we can reasonably expect the strength of WiFi A in the bedroom to differ; say it is 2. We can exploit this difference to predict which room we’re in. What’s more: WiFi network B from our neighbor can only be detected from the living room but is effectively invisible from the kitchen. That makes prediction even easier. In sum, the list of all in-range WiFi gives us plentiful information. working well where other techniques such as GPS are weak. The more walls the better, as the more disparate the WiFi network strengths, the easier the rooms are to classify. You will build a simple desktop app that collects data, learns from the data, and predicts which room you’re in at any given time. For this tutorial, you will need a Mac OSX. Whereas the code can apply to any platform, we will only provide dependency installation instructions for Mac. Your desktop app will be written in NodeJS. However, to leverage more efficient computational libraries like numpy, the training and prediction code will be written in Python. To start, we will setup your environments and install dependencies. Create a new directory to house your project. Use pip to install Python’s default virtual environment manager. Create a Python3.6 virtual environment named riot. With the working directory setup, we will start with a desktop app that records all WiFi networks in-range. These recordings will constitute training data for your machine learning model. Once we have data on hand, you will write a least squares classifier, trained on the WiFi signals collected earlier. Finally, we will use the least squares model to predict the room you’re in, based on the WiFi networks in range. In this step, we will create a new desktop application using Electron JS. To begin, we will instead the Node package manager npm and a download utility wget. To begin, we will create a new Node project. This prompts you for the package name and then the version number. Hit ENTER to accept the default name of riot and default version of 1.0.0. This prompts you for the entry point, or the main file to run the project from. Enter app.js. This prompts you for the test command and git repository. Hit ENTER to skip these fields for now. This prompts you for keywords and author. Fill in any values you would like. Below, we use iot, wifi for keywords and use John Doe for the author. This prompts you for the license. Hit ENTER to accept the default value of ISC. At this point, npm will prompt you with a summary of information so far. Your output should be similar to the following. Hit ENTER to accept. npm then produces a package.json. List all files to double-check. This will output the only file in this directory, along with the virtual environment folder. Install NodeJS dependencies for our project. Start with main.js from Electron Quick Start, by downloading the file, using the below. The following -O argument renames main.js to app.js. Open app.js in nano or your favorite text editor. On line 12, change index.html to static/index.html, as we will create a directory static to contain all HTML templates. Save your changes and exit the editor. Your file should match the source code of the app.js file. Now create a new directory to house our HTML templates. Download a stylesheet created for this project. Open static/index.html in nano or your favorite text editor. Start with the standard HTML structure. Right after the title, link the Montserrat font linked by Google Fonts and stylesheet. Between the main tags, add a slot for the predicted room name. Your script should now match the following exactly. Exit the editor. Now, amend the package file to contain a start command. Right after line 7, add a start command that’s aliased to electron .. Make sure to add a comma to the end of the previous line. Save and exit. You are now ready to launch your desktop app in Electron JS. Use npm to launch your application. Your desktop application should match the following. This completes your starting desktop app. To exit, navigate back to your terminal and CTRL+C. In the next step, we will record wifi networks, and make the recording utility accessible through the desktop application UI. In this step, you will write a NodeJS script that records the strength and frequency of all in-range wifi networks. Create a directory for your scripts. Open scripts/observe.js in nano or your favorite text editor. Import a NodeJS wifi utility and the filesystem object. Define a record function that accepts a completion handler. * Uses a recursive function for repeated scans, since scans are asynchronous. Inside the new function, initialize the wifi utility. Set iface to null to initialize to a random wifi interface, as this value is currently irrelevant. Define an array to contain your samples. Samples are training data we will use for our model. The samples in this particular tutorial are lists of in-range wifi networks and their associated strengths, frequencies, names etc. Define a recursive function startScan, which will asynchronously initiate wifi scans. Upon completion, the asynchronous wifi scan will then recursively invoke startScan. In the wifi.scan callback, check for errors or empty lists of networks and restart the scan if so. Add the recursive function’s base case, which invokes the completion handler. Output a progress update, append to the list of samples, and make the recursive call. At the end of your file, invoke the record function with a callback that saves samples to a file on disk. Save and exit. Run the script. Your output will match the following, with variable numbers of networks. Examine the samples that were just collected. Pipe to json_pp to pretty print the JSON and pipe to head to view the first 16 lines. The below is example output for a 2.4 GHz network. This concludes your NodeJS wifi-scanning script. This allows us to view all in-range WiFi networks. In the next step, you will make this script accessible from the desktop app. In this step, you will first add a button to the desktop app to trigger the script with. Then, you will update the desktop app UI with the script’s progress. Insert the “Add” button, as shown below. Save and exit. Open static/add.html. Save and exit. Reopen scripts/observe.js. 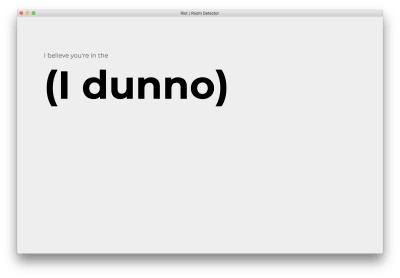 Beneath the cli function, define a new ui function. Update the desktop app status to indicate the function has started running. status.innerHTML = "Listening for wifi..."
Partition the data into training and validation data sets. Still within the completion callback, write both datasets to disk. 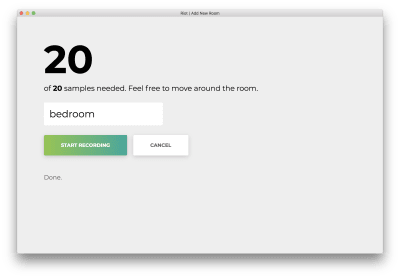 Invoke record with the appropriate callbacks to record 20 samples and save the samples to disk. Finally, invoke the cli and ui functions where appropriate. Start by deleting the cli(); call at the bottom of the file. Check if the document object is globally accessible. If not, the script is being run from the command line. In this case, invoke the cli function. If it is, the script is loaded from within the desktop app. In this case, bind the click listener to the ui function. Save and exit. Create a directory to hold our data. You will see the following homepage. Click on “Add room”. You will see the following form. Type in a name for the room. Remember this name, as we will use this later on. Our example will be bedroom. Click “Start recording,” and you will see the following status “Listening for wifi…”. Click on the misnamed “Cancel” to return to the homepage, which matches the following. We can now scan wifi networks from the desktop UI, which will save all recorded samples to files on disk. Next, we will train an out-of-box machine learning algorithm-least squares on the data you have collected. In this step, we will write a training script in Python. Create a directory for your training utilities. At the top of your file, import the numpy computational library and scipy for its least squares model. The next three utilities will handle loading and setting up data from the files on disk. Start by adding a utility function that flattens nested lists. You will use this to flatten a list of list of samples. """Flatten a list of lists to make a list. Add a second utility that loads samples from the specified files. This method abstracts away the fact that samples are spread out across multiple files, returning just a single generator for all samples. For each of the samples, the label is the index of the file. e.g., If you call get_all_samples('a.json', 'b.json'), all samples in a.json will have label 0 and all samples in b.json will have label 1. """Load all samples from JSON files.""" Next, add a utility that encodes the samples using a bag-of-words-esque model. Here is an example: Assume we collect two samples. wifi network B at strength 20 and wifi network C at strength 25. This function will produce a list of three numbers for each of the samples: the first value is the strength of wifi network A, the second for network B, and the third for C. In effect, the format is [A, B, C]. """Apply bag-of-words encoding to categorical variables. Using all three utilities above, we synthesize a collection of samples and their labels. Gather all samples and labels using get_all_samples. Define a consistent format ordering to one-hot encode all samples, then apply one_hot encoding to samples. Finally, construct the data and label matrices X and Y respectively. """Create dataset from a list of paths to JSON files.""" These functions complete the data pipeline. Next, we abstract away model prediction and evaluation. Start by defining the prediction method. The first function normalizes our model outputs, so that the sum of all values totals to 1 and that all values are non-negative; this ensures that the output is a valid probability distribution. The second evaluates the model. """Convert one-hotted outputs into probability distribution"""
Next, evaluate the model’s accuracy. The first line runs prediction using the model. The second counts the numbers of times both predicted and true values agree, then normalizes by the total number of samples. """Evaluate model w on samples X and labels Y.""" This concludes our prediction and evaluation utilities. After these utilities, define a main function that will collect the dataset, train, and evaluate. Start by reading the list of arguments from the command line sys.argv; these are the rooms to include in training. Then create a large dataset from all of the specified rooms. Apply one-hot encoding to the labels. A one-hot encoding is similar to the bag-of-words model above; we use this encoding to handle categorical variables. Say we have 3 possible labels. Instead of labelling 1, 2, or 3, we label the data with [1, 0, 0], [0, 1, 0], or [0, 0, 1]. For this tutorial, we will spare the explanation for why one-hot encoding is important. Train the model, and evaluate on both the train and validation sets. Print both accuracies, and save the model to disk. At the end of the file, run the main function. Save and exit. Recall the room name used above when recording the 20 samples. Use that name instead of bedroom below. Our example is bedroom. We use -W ignore to ignore warnings from a LAPACK bug. Since we’ve only collected training samples for one room, you should see 100% training and validation accuracies. Next, we will link this training script to the desktop app. In this step, we will automatically retrain the model whenever the user collects a new batch of samples. Open scripts/observe.js. Right after the fs import, import the child process spawner and utilities. In the ui function, add the following call to retrain at the end of the completion handler. After the ui function, add the following retrain function. This spawns a child process that will run the python script. Upon completion, the process calls a completion handler. Upon failure, it will log the error message. Save and exit. Open scripts/utils.js. Add the following utility for fetching all datasets in data/. Save and exit. For the conclusion of this step, physically move to a new location. There ideally should be a wall between your original location and your new location. The more barriers, the better your desktop app will work. Once again, run your desktop app. Just as before, run the training script. Click on “Add room”. 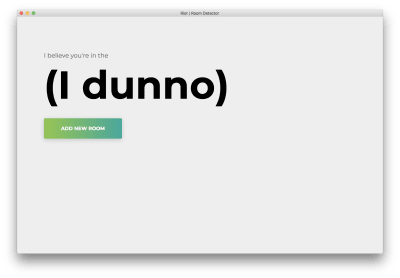 Type in a room name that is different from your first room’s. We will use living room. In the next step, we will use this retrained model to predict the room you’re in, on the fly. In this step, we will load the pretrained model parameters, scan for wifi networks, and predict the room based on the scan. Import libraries used and defined in our last script. Define a utility to extract the names of all datasets. This function assumes that all datasets are stored in data/ as <dataset>_train.json and <dataset>_test.json. Define the main function, and start by loading parameters saved from the training script. Create the dataset and predict. Compute a confidence score based on the difference between the top two probabilities. Finally, extract the category and print the result. To conclude the script, invoke the main function. Next, we will connect this evaluation script to the desktop app. The desktop app will continuously run wifi scans and update the UI with the predicted room. In this step, we will update the UI with a “confidence” display. Then, the associated NodeJS script will continuously run scans and predictions, updating the UI accordingly. Add a line for confidence right after the title and before the buttons. Right after main but before the end of the body, add a new script predict.js. Save and exit. Open scripts/predict.js. Import the needed NodeJS utilities for the filesystem, utilities, and child process spawner. Define a predict function which invokes a separate node process to detect wifi networks and a separate Python process to predict the room. After both processes have spawned, add callbacks to the Python process for both successes and errors. The success callback logs information, invokes the completion callback, and updates the UI with the prediction and confidence. The error callback logs the error. Define a main function to invoke the predict function recursively, forever. One last time, open the desktop app to see the live prediction. Approximately every second, a scan will be completed and the interface will be updated with the latest confidence and predicted room. Congratulations; you have completed a simple room detector based on all in-range WiFi networks. In this tutorial, we created a solution using only your desktop to detect your location within a building. We built a simple desktop app using Electron JS and applied a simple machine learning method on all in-range WiFi networks. This paves the way for Internet-of-things applications without the need for arrays of devices that are costly to maintain (cost not in terms of money but in terms of time and development). Note: You can see the source code in its entirety on Github. With time, you may find that this least squares does not perform spectacularly in fact. Try finding two locations within a single room, or stand in doorways. Least squares will be large unable to distinguish between edge cases. Can we do better? It turns out that we can, and in future lessons, we will leverage other techniques and the fundamentals of machine learning to better performance. This tutorial serves as a quick test bed for experiments to come.